Pets that walk outside at this time of year might expose themselves to potentially toxic chemicals contained in de-icing salts. These products can reach the cushions and skin on your pet’s paws. Pads can become irritated, chapped or cracked. After an outing, dogs and cats that groom themselves or lick their paws could expose themselves to these products. The ingestion of these products in small quantities can cause excessive salivation, nausea or vomiting. In larger amounts, the ingestion of these products could cause an irritation of the mouth and digestive system, and be more dangerous for your pets. You can get small boots for your pets to protect their paws during outings. Before a walk, you can coat your pet’s cushions with petroleum jelly by slowly massaging them. This can help to protect the cushions from the chemicals and salts found on the streets, sidewalks and pavements. 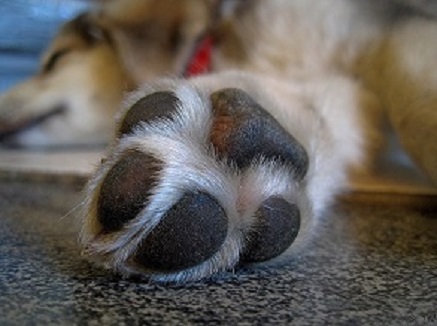 After every walk, you can rinse your pet’s paws to remove all the residues. Make sure to dry the paws with a towel and don’t forget to dry between each toe. Take advantage of this moment to look between the toes for the presence of redness or irritation. Consult your veterinarian if this is the case. You can ask a groomer to cut your pet’s hair under the paws and between the toes. This will reduce the amount of ice and chemicals that stick to your pet’s paws. Do not let your pet drink in puddles that could contain de-icing products or eat snow in these areas. If you have these chemicals at home, make sure to store them safely in a sealed container out of reach. Do not hesitate to contact your veterinarian if you have any questions or concerns.